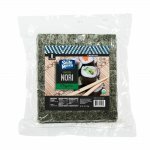 Nishiki Premium Grade Rice 50LB [NISHR] - $55.00 : SushiMaven.com, Your Source For Everything Sushi! Nishiki rice is a popular form of Japanese rice that is often called medium-grained rice and is grown in California. It actually falls into the class of short-grained rice but it is slightly longer than the average short-grained variants. Nishiki Rice is very similar to Calrose rice.